A special type of orbit that is cleverly chosen such that the variation in the mean Kepler elements under the influence of Earth’s irregular gravity field is minimized. There are six intuitive orbital components that are often used to describe the shape and orientation of a satellite orbit. These elements are varying constantly due to perturbations, but for a cleverly chosen orbit, the frozen orbit, the long-term effects of at least some of these perturbations can be cancelled. 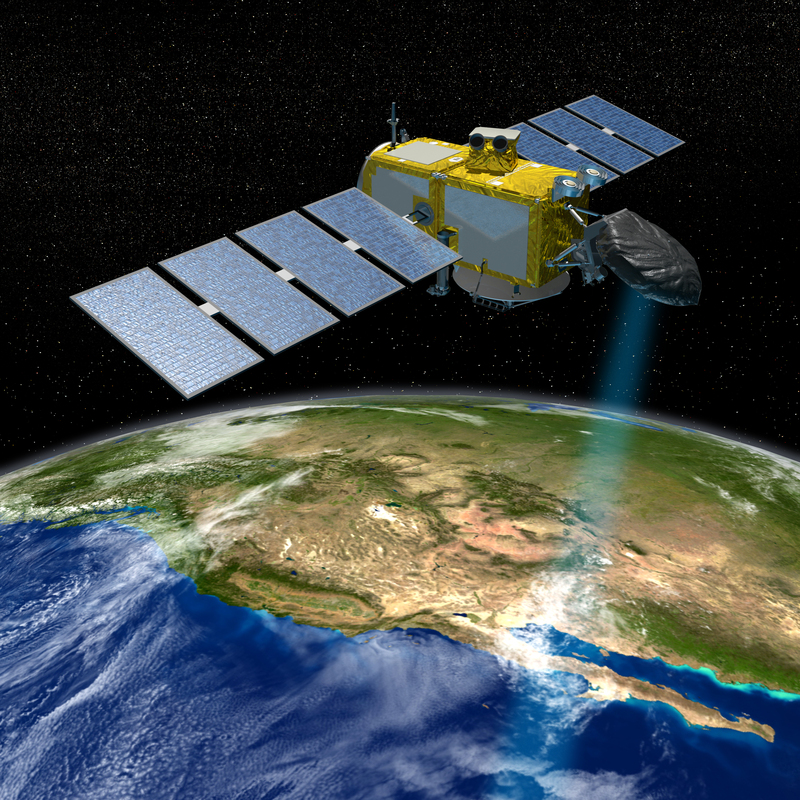 In 1978, a key Earth observation satellite was launched from Vandenberg AFB in the United States. This satellite, carrying the name Seasat, was to monitor Earth’s oceanographic phenomena. To carry out this mission, the satellite was equipped with an array of Earth observation instruments, such as the first space-borne Synthetic Aperture Radar (SAR) and a radar altimeter. 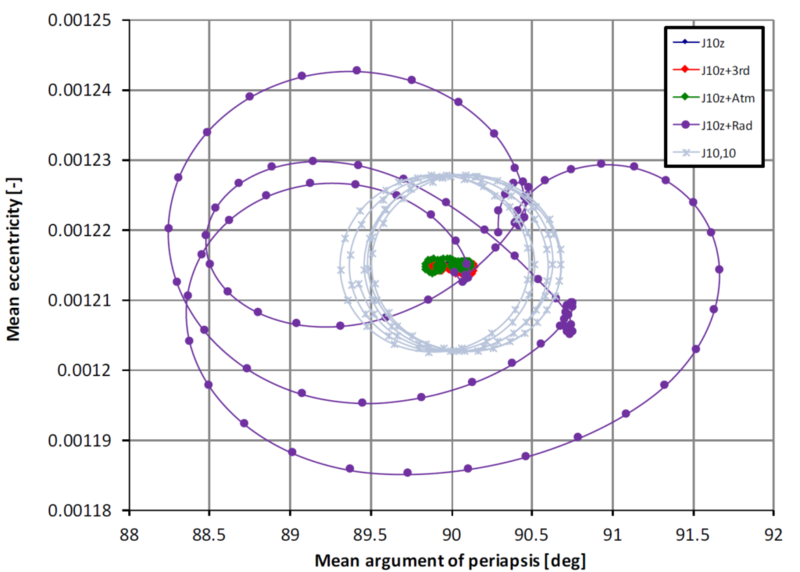 To maximize the quality of the data from these instruments, the orbit had to be carefully selected in order to minimize the influence of orbital perturbations. As such, Seasat was the first mission to make use of a so-called ‘frozen orbit’. The paper on the orbit design of Seasat, (Cutting et al, 1978) demonstrated the existence of a family of near-circular polar orbits that suffered from minimal secular variations in the mean argument of pericenter (ω) and the mean eccentricity (e). Normally, these two orbital elements suffer from variations caused by the flattening of the Earth at the poles (the equatorial bulge, or J2-effect). It is possible to ensure static behavior of the argument of pericenter and the eccentricity by placing the satellite in an orbit at the critical inclination (63.4 degrees), but global coverage is not possible at this inclination. For Seasat, a minimal variation in both the mean argument of pericenter and mean eccentricity was a necessity, as this would guarantee a constant altitude profile above Earth’s surface as a function of latitude only. Theoretically, this would eliminate the need for corrective maneuvers. Despite Seasat’s early failure after just 105 days in orbit, it gathered more oceanographic altimetry data than all other surface-based efforts before it. The newly applied frozen orbit concept proved to be successful and has been applied to numerous missions since. Well-known Earth observation missions such as Envisat, ERS-1 and ERS-2 all fly in Sun-synchronous, repeating ground track frozen orbits. Where e, a, i and ω denote the mean eccentricity, semi-major axis, inclination and argument of pericenter, respectively. RE is Earth’s equatorial radius, and J2 and J3 are the coefficients for the zonal expansion of the gravity field. Simple as the equation for the frozen eccentricity may be, its derivation is rather complicated. Additionally, it is emphasized that only taking into account the first two zonal terms of the gravity field does not make for a very realistic representation. However, the complicated derivation can be repeated for more realistic zonal gravity field models, and though the resulting expressions are nowhere near elegant, they can be solved numerically. This way, it can be shown that the inclusion of higher degree zonal terms (all the way up to J25, for example) has a significant effect on the final frozen eccentricity. Many more research efforts have been put into further refining the required conditions for a frozen orbit, most of them venturing deep into the field of higher order astrodynamics. However, most of these methods rely on formulating the perturbing accelerations as a disturbing potential, and this limitation may be overcome when using a purely numerical method to find frozen orbit conditions. The prediction of a satellite trajectory is made easy nowadays by numerically integrating the equation of motion, to which models for various orbital perturbations can be added. Aerodynamic drag, solar radiation pressure, third-body gravity and of course, Earth’s irregular gravity field; all of these can be taken into account. However, numerically integrated orbits result in state predictions in terms of osculating orbital elements, whose behavior is governed by short-periodic, long-periodic, secular and continuous variations, caused by orbital perturbations. It is possible to remove these effects and thus to transform from osculating to mean elements by making use of the so-called Eckstein-Ustinov theory (Spiridonova et al, 2014) and numerical averaging. Especially for near-circular orbits it is not possible to transform from osculating to mean elements by averaging only. With such a tool, it is possible to take a closer look at the behavior of the mean eccentricity and mean argument of pericenter for a satellite actually flying in a frozen orbit. In Figure 1, the evolution of these elements has been plotted for ERS-2 throughout 2004, showing nearly static behavior close to the original design values. This serves as verification for reconstruction methods. Figure 1 – Evolution of the actual mean argument of pericenter and mean eccentricity of ERS-2 in 2003. Green and red marks the start and end of the year, respectively, and each dot marks the averaged mean orbital elements for a day. With the mean elements available, and with the goal to minimize variations in two of these components, it is possible to approach this goal as an optimization problem. This can be done by numerically integrating the trajectories resulting from a variety of injection positions and velocities, and evaluating the variations in the mean argument of pericenter and the mean eccentricity for these predicted trajectories. The resulting approach can be verified for the case of using simple zonal gravity field models, as for these models the numerical method can be compared to analytical solutions. 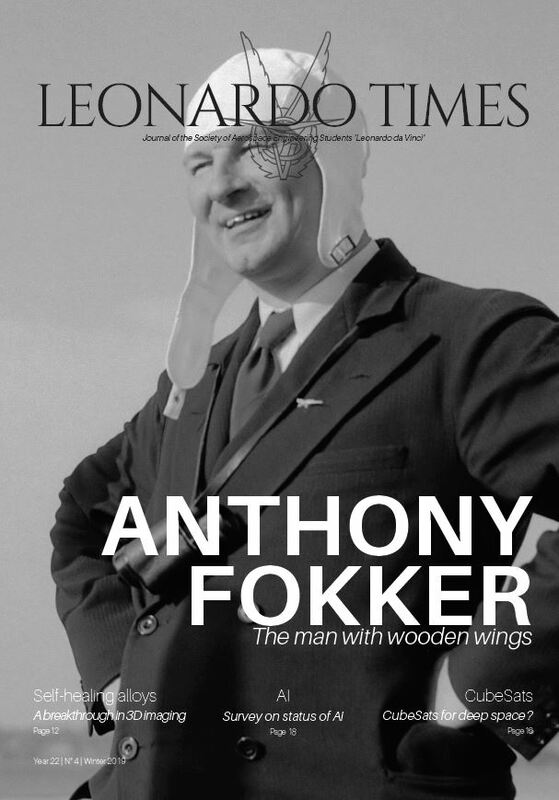 The found frozen mean eccentricities match to within 0.1%. When looking for the frozen eccentricity in realistic force models, e.g. taking into account drag, radiation pressure, third-body gravity and a gravity field model complete up to degree and order 25, it follows that the frozen conditions do not significantly change when compared to the case of a simple zonal model complete up to degree 10 (J10). Therefore, the analytical solution ‘does the job’ just as well. The influence of non-zonal perturbations can be determined by numerically integrating the found frozen orbit by including various perturbations, as shown in Figure 2. From this figure, it becomes apparent that radiation pressure is the most influential perturbation, next to the inclusion of tesseral and sectorial gravity field terms. ERS-2 is not affected by radiation pressure as much (Figure 1), as it is placed in a Sun-synchronous orbit. 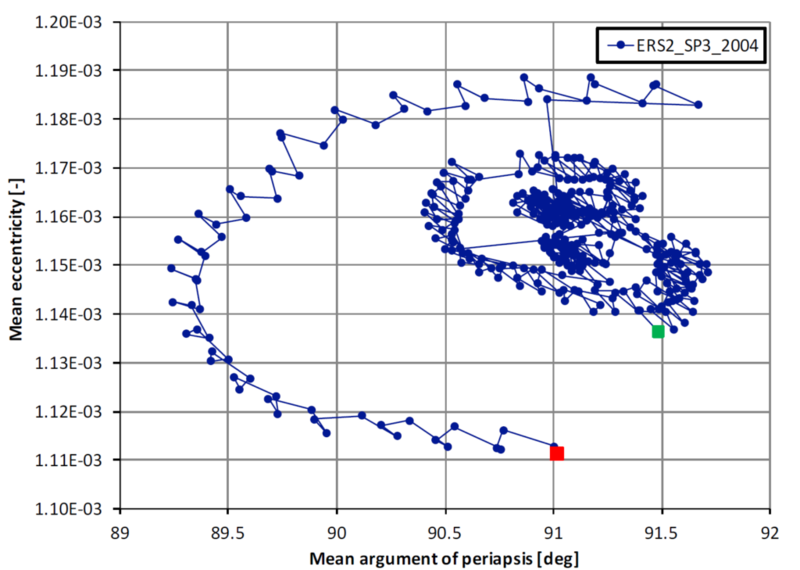 Figure 2 – Evolution of the simulated mean argument of pericenter and mean eccentricity for a frozen orbit under the influence of several non-zonal perturbations. Time between marks is one week. The combination of numerical integration, optimization, and transformation from osculating to mean elements has led to an alternative design method for frozen orbits. Whilst being quite computationally expensive and performing just as well as simpler analytical models, there is potential in the chosen approach. The objective function used to minimize variations in the mean argument of pericenter and mean eccentricity can be adapted to minimize variations in other orbital elements, or optimize for a certain variation (a Sun-synchronous orbit, for example).